“[The historian] Arthur Schlesinger talked about him being the greatest secretary of agriculture in American history,” said Peter Kuznick. “He turned the agricultural economy around. In 1932, the farm income was one-third of what it had been before the Depression started, and Wallace reversed it and put it back on its feet. But during the ’30s, he was America’s leading progressive. “Wallace “actually was, in terms of his politics, more progressive than Bernie Sanders,” said Paul Jay. “In fact, he makes Bernie Sanders look like a centrist moderate. “The party bosses sought to remove Wallace from the ticket for Roosevelt’s third presidential run. “The segregationists in the South hated him,” said Kuznick. “He was the leading spokesman for black civil rights. The misogynists hated him. He was the leading spokesperson for women’s inequality. The British and the French hated him. They implored Roosevelt to get him off the ticket as vice president because he was writing pamphlets and speaking openly about the need to end British and French colonialism. He said that America’s fascists are those people who think that Wall Street comes first and the American people second. 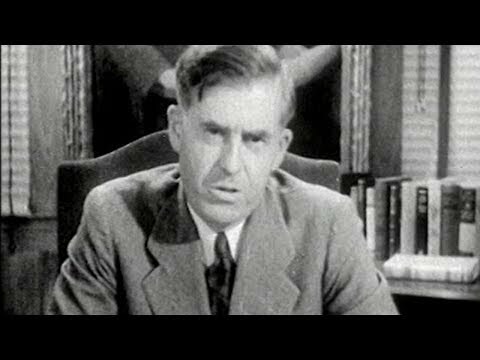 “After FDR wrote a letter saying he would reject the nomination if Wallace was removed, the beloved progressive politician was put back on the ticket. “Once you have the Cold War, McCarthyism, and the House Un-American Activities Committee and essentially purge the unions of most of the really progressive leadership, what you’re left with is a union leadership that merges with the elites and in fact become elites themselves,” said Jay. “And so the Democratic Party, instead of this place where you have this united front of different classes contending, you have the whole preponderance of leadership now representing the elites.